Enjoy your Country Porch from your Bedroom. This Bedroom floor plan opens with French doors to a long side Country Porch. The long keeping room with its exposed beams offers a wide fireplace and dining area. A convenient 'U'-shaped kitchen has a half-wall & shelf separating it from the main room. A shower bath is near the master bedroom which sports French doors to a wide side porch which could be screened for summer dining. 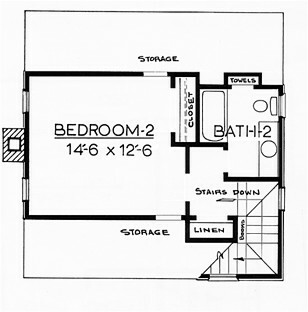 The master bedroom has two wide closets. Note that the linen closet has space for a washer below its shelves. Upstairs holds a second bedroom & private bath. The linen closet at the top of the stairs can be eliminated for a more open feeling. 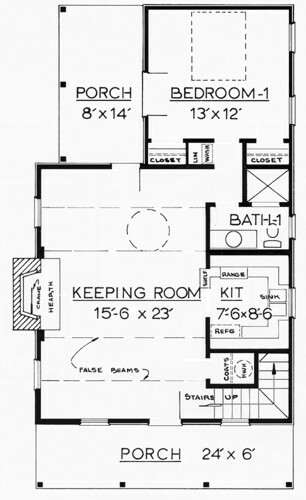 The alternate frame plan, F-1001-A, has a larger country kitchen with a rear porch. The master bath has its own whirlpool bath. Upstairs, a front dormer with its circle-top window is added over the full country porch. This alternate plan, F-1001-A, is included with the purchase of the basic Log Plan L-1001. 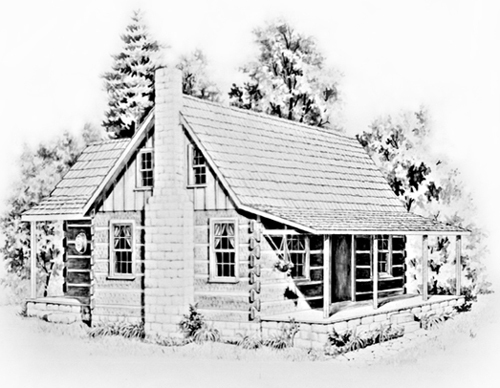 This Log Plan is designed using chinked, 6x12 dovetail logs, but other types of logs may be used.